The moment of truth has finally arrived. If you don’t know already, my sworn rival and I are having a food blog battle today. After you check out my creation below, be sure to go look at whatever thing he has concocted. Also, be sure to vote on one our sites for your favorite. It doesn’t matter what site you vote on. The forms are linked to the same poll. I think we picked two great ingredients out of the possible ingredients. They actually go together pretty nicely and could be used in a ton of different dishes. I thought about doing something curryish, then considered using a nice piece of pork to bring the two ingredients together. 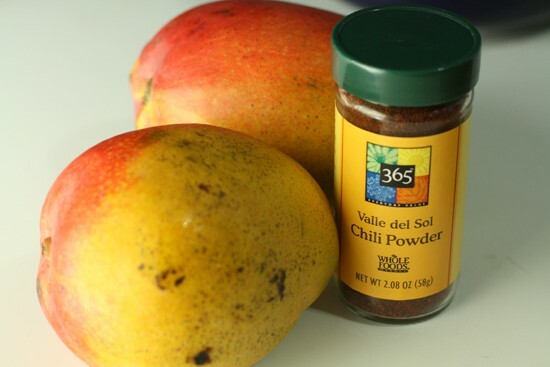 I also considered making my own chili powder which isn’t too hard, but I couldn’t easily find good dried chilies. Ultimately, I decided to go sweet. Dessert. I wanted to apply the two secret ingredients to an old-fashioned recipe: cobbler and ice cream. So I made a Mango Cobbler with Chocolate Chili Powder Ice Cream. There are a lot of recipes out there for ice cream, at the end of the day I adapted this one from David Lebovitz. Obviously, I changed it to add the special ingredients. Homemade chocolate chili ice cream plus a delicious cobbler for serving! 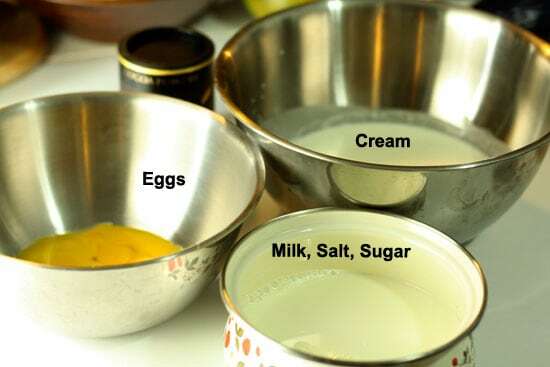 1) Combine all ingredients except cream and eggs in a medium saucepan. 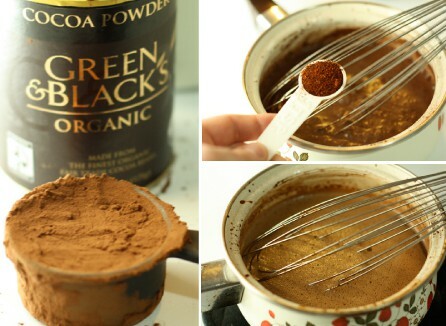 2) Whisk this together really well over medium heat until it starts to boil. Then you need to add this mixture to your eggs to make a custard base. Start by adding a little of your warm mixture to your eggs to temper them. This will get your eggs up to temperature. After your eggs are warm, you can add them back to your sauce pan without fear of making scrambled eggs. 3) Then return this to the heat until this thickens a bit – probably 5 minutes on low. 4) Once your custard coats the back of a spoon nicely, strain this custard mixture into your bowl of cream. If you are super confident in your custard abilities then you don’t need to strain it I guess. 5) Then chill that mixture over an ice bath until it is cool. 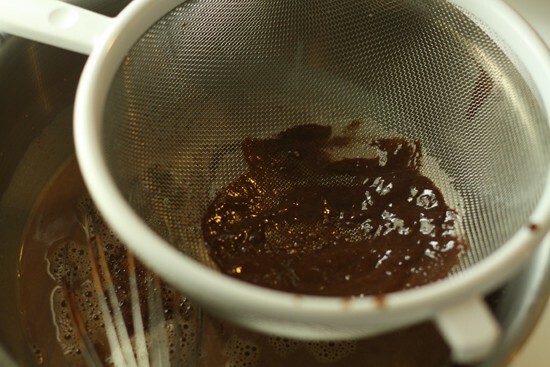 6) Once the mixture is chilled, churn it according to instructions on your ice cream maker. If you don’t have a maker, pour the mixture into a 13 by 9 baking dish and put it in the ice box. After about 45 minutes, take it out and with a whisk or fork, or electric mixer if you are a wuss, beat it up. Your goal is to break up all of the ice crystals that have formed and make it smooth. 7) If you don’t have an ice cream maker you’ll have to keep repeating this freezing/whisking process every 30 minutes until it turns into, well, ice cream. 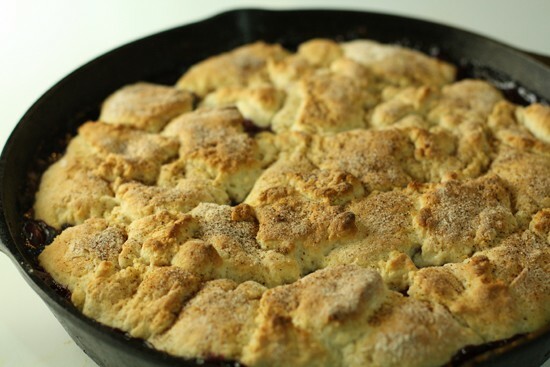 I made mine the day before I made my cobbler and it keeps great for days. First thing is to combine everything except the cream and eggs into a medium sauce pan. Whisk this together really well over medium heat until it starts to boil. Then you need to add this mixture to your eggs to make a custard base. 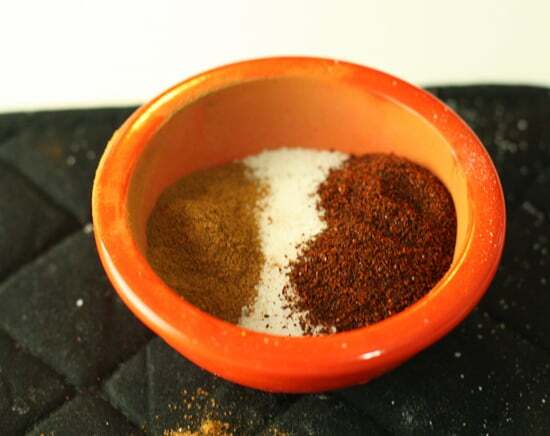 Start by adding a little of your warm mixture to your eggs to temper them. This will get your eggs up to temperature. After your eggs are warm, you can add them back to your sauce pan without fear of making scrambled eggs. I added about half of my hot mixture slowly and then added the egg mixture back to the other half of hot milk. Then return this to the heat until this thickens a bit – probably 5 minutes on low. The smell of chili powder was in the air. Once your custard passes the back of the spoon test, strain this custard mixture into your bowl of cream. You strain it just to get out any little bits of egg that accidentally cooked. If you are super confident in your custard abilities then you don’t need to strain it I guess. Then chill that mixture over an ice bath until it is cool. Nobody likes scrambled eggs in their ice cream. 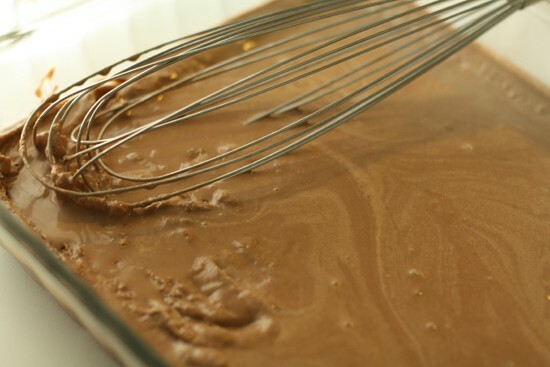 Once it is chilled, pour this mixture into a 13 by 9 baking dish and put it in the ice box. After about 45 minutes, take it out and with a whisk or fork, or electric mixer if you are a wuss, beat it up. Your goal is to break up all of the ice crystals that have formed and make it smooth. It’s a little bit of work. Don’t be a wuss. Return it to the freezer and repeat the beating every 30 minutes until it turns into, well, ice cream. 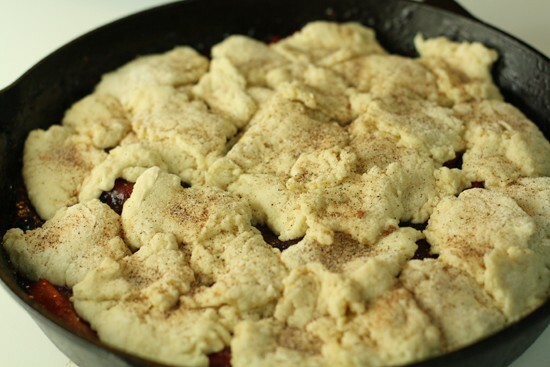 I made mine the day before I made my cobbler and it keeps great for days. The Cobbler. A good cobbler, in my mind, has a rich fruity filling with a thick crust. A good cobbler also requires ice cream so it is a good thing we have that covered. 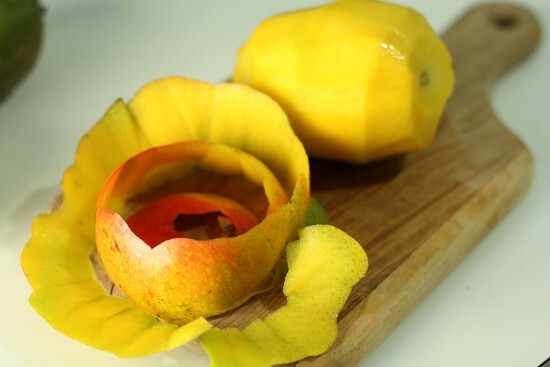 First, peel your mangoes. If you are good, you can do this. Extra points for keeping the peel in one piece! 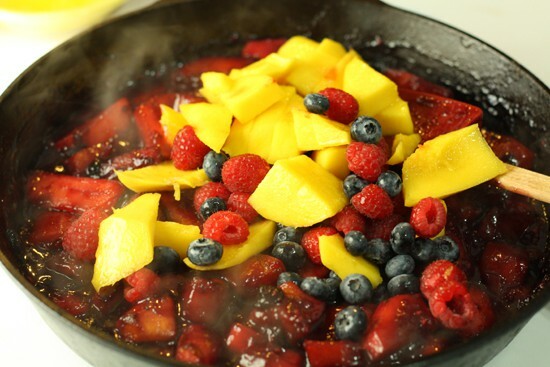 Then get a large, oven-safe skillet and add about 3/4 of your mangoes and berries and all of your other filling ingredients. Cover this with foil and let it cook on the stove over medium heat for about 15 minutes. 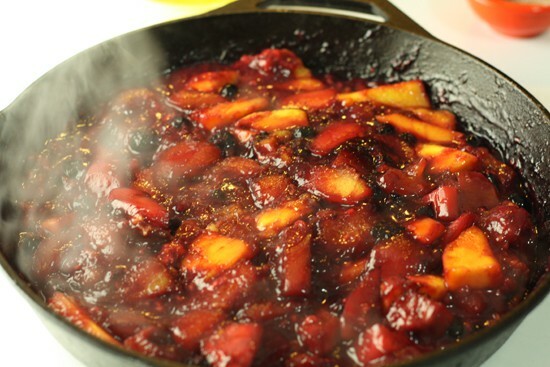 This will cook down the fruit so your end result isn’t too runny. Nobody likes a runny cobbler. After it cooks down for 15 minutes, I added the rest of my fruit. This gave the final product different textures which is good. Also, it was at this moment that I realized the berries may have been a bit overkill. 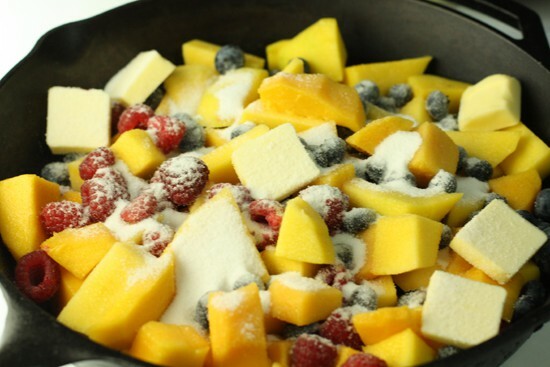 Once the fresh fruit is mixed in and warmed, add your thickener mixture of corn starch and lemon juice. Mix together the corn starch and lemon juice before you add it. Ready to get a topping of deliciousness. Ok. Cover that so it stays warm (I just use a piece of foil) and work on your topping. Combine all of your topping ingredients in a bowl and they should come together into a pretty wet dough. I added a bit more flour than the original recipe called for because it was too wet to work with. Eventually I got it into a ball. 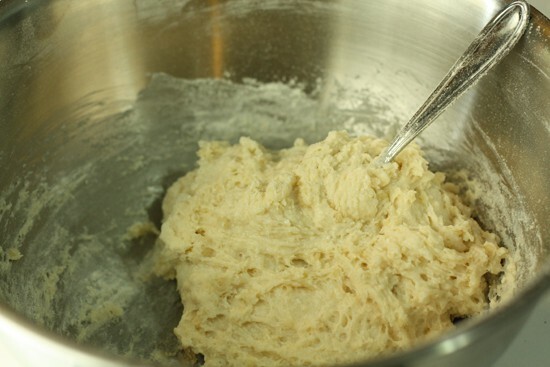 Back to the dough, knead your dough a few times on a floured surface. Just knead it for a few seconds, you want to keep it pretty light. Then roll it out into a 1/2 in thick rectangle and rip it up into chucks and throw it on your cobbler filling. It’s supposed to look kind of messy. Nobody likes a clean cobbler. I also sprinkled it with a good amount of my chili sugar. This produced a great smell. The smell of VICTORY. It will be hard, but let this cool for 10 minutes before eating. Then serve it up! It looks good on a plate, but I like mine in a bowl so I can mix it all together. I like mine in a bowl. The Verdict. I had about 10 different people try this combo I created and I think it went really well. The only criticism was that the mangos got a little bit lost in the cobbler. Luckily, I kept my pieces pretty large so there were still large chunks of mango. The color of the raspberries took over the dish though. The ice cream was a unanimous winner. The savory chili flavor was enhanced by the cocoa powder and it worked perfectly. It also paired perfectly with the cobbler. This battle is all in good fun, but Dan and I still wanted to give our readers a way to vote. Use the below poll to vote and as I said before, the poll on his site and mine are linked so no need to vote twice and it doesn’t matter which site you vote on. We didn’t really think of specific criteria to judge on, so use whatever criteria you want I guess! Hope you guys liked my sweet take on these ingredients! Update: Dan and I decided to close the polls at Noon on Tuesday, so vote by then. I would try both- but, I am positive I would like yours better Nick. Also, unless I am mistaken, (and that could be possible since he recently re-vamped his site), it seems that some of my comments have been deleted from Dan's site- bizarre, right? Because I've never said anything derogatory…maybe they just can't handle my sense of humor…? Dunno, Don't care. And I promise that didn't have anything to do w/ my vote. Macheesmo is better, hands down. And this battle is definitely yours Nick. Yea, my posts tend to be all over the place don't they? as for deleting your comments, if it is old comments you are talking about, I single handedly migrated EVERY SINGLE ONE of the 700+ comments from my old blog software to the new one by MANUALLY copy and pasting them as new comments! so if I missed one or two i wouldn't be surprised, but I never deleted anything based on "not handling" anyones sense of humor. Overall, I liked what you did better than Dan (who gets kudos for a quality effort). I have a sweet tooth though, so that might make me bias. Also, I have to support my fellow DC food bloggers :) Nicely done, and nice pic on Tastespotting. The talking smack in the comments here made me laugh out loud. First of all, both entries look fantastic, like I want to eat them, and I want to eat them right now. It's awesome to see such different executions with two of the same ingredients. You got my vote, Nick, mainly because I saw yours first (sorry, FoodinmyBeard – the meat was mouth-watering, truly) and because, OH MY GOSH, a cobbler with ice cream? This girl loves her sugar. This was so fun! I ultimately voted for macheesmo because I'm partial to deserts and also because the ingredients on food in my beard were so varied I don't think I'd be able to parse out the different flavors of the different ingredients if I ate it. (I know- I don't taste very well – odd for someone who likes food and food blogs). I prefer to keep it more simple.. I was so impressed by the effort though! Drying out the mangos and chili! I really like the concept of the food blog battle! :) And Macheesmo, I definitely voted for your concoction – love the idea of chocolate chili ice cream! Nick! I'm sad I didn't get a taste of that ice cream. I hope there are leftovers! ;) Good work! Sounds absolutely delicious. TFIMB's chicken looked really good, but you had me at "cobbler". I'm definitely going to have to try this. I owe you The Most Profuse Apology EVAR. But that's neither here nor there- that was a dickish remark to make, and I am truly sorry. Please don't be offended that I said your post was all over the place- you said it yourself- most or your posts are and that's part of the reason I love your blog- each post is like a new adventure. And like I said- I'm personally not big on mango- and I felt like your post was, more so,- so – end explanation. I sense teh hate in ur response, so I'z stoppin' nao- sigh. I can haz forgive-ness? Thanks for the comments everyone. It was a tough battle. Dan really brought the heat which is what I expected. It was very fun though and look out for more of these in the future. sorry we had a fight in the middle of your black panth-ah pard-eh. Thanks for the support though! This dessert is amazing! 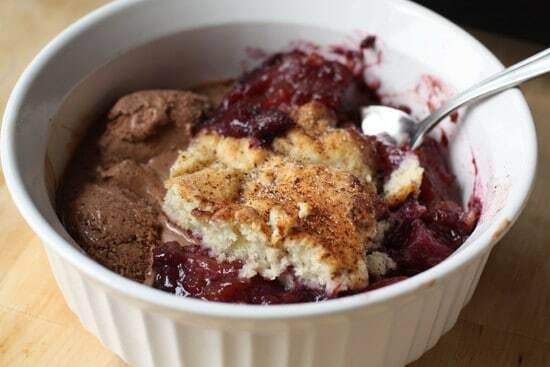 Ice cream and cobbler, what could be better?! I'm on Spring break now, so I can't wait to start experimenting with ice creams. Thanks for sharing! I find it interesting that in the first 26 hours of this battle you were only able to get 100 votes. But in the last hour you were able to more than double your votes. Its just statistically interesting, that's all I'm saying. Your dish does look delicious, however, I feel your "challenger" did a much better job at using the ingredients in a more creative way. 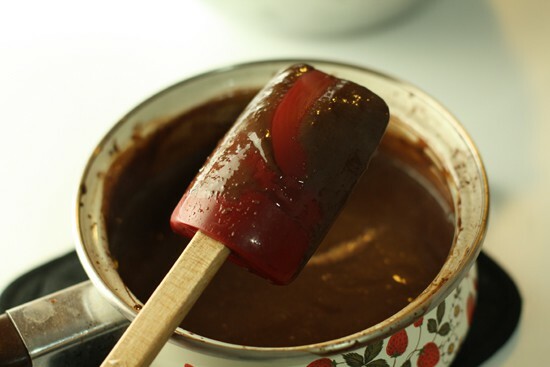 Both of your sites are fun to read, but you know, I did notice something in my literary travels…the other guy made a chili chocolate ice cream a while ago! Hmmm….my vote goes to THEFOODINMYBEARD! Ooh ooh mango and chili are a great combo, but throw in chocolate, berries and cobbler crust…well, you definitely win! Great idea, looks delicious. Hi Nick! I stumbled upon your website tonight and I have been reading for like 3 hours! Your recipes are great and your photos are incredible. I have been wanting to make ice cream but every recipe I have found says to use an ice cream maker… I'm going to try this next weekend. Never heard of chili ice cream before, even though I’m an ice cream enthusiast, I even play Papas Freezeria ice cream game haha. I’ll give it a shot, wanna try this recipe!